The wealthiest of the wealthy – those whose fortunes far exceed what they need to sustain themselves – frequently go in search of something on which they can spend their astonishing riches. And, often, they've turned to art. Franklin & Marshall senior Sevket Alperen Akkoyunlu, who won last year’s Jacob J. Miller Prize in Economics, examined how finance and art intersect. As part of his Marshall project, "Economic inequality and its links to patronage," he did research over spring break at Bocconi Business University in Milan, Italy. At Bocconi, Akkoyunlu accessed extensive archives of tax data that trace how inequality evolved in the flourishing era of the Italian Renaissance. The Medici family of Florence used its banking riches to give rise to astonishing artwork, supporting masters such as Leonardo da Vinci, Michelangelo, Brunelleschi, and Donatello. 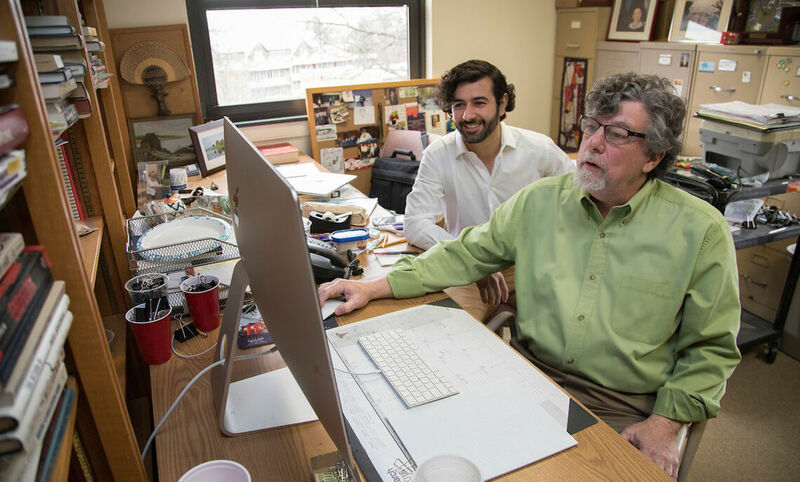 "There are lots of interactions between the way the arts of the Western world have developed and the patronage system that allowed it to do so," said F&M Economics Professor Sean Flaherty, Akkoyunlu's adviser. "In today's market system, where do artists go to live and produce? New York City," Flaherty said. "Many rich people live in New York City, and those are the kinds of people who can afford to pay artists to produce art." There is a "small change in perception" between the Medici and the modern art patron, Akkoyunlu said. "The rich today prefer not the production of art as much, but investing in art. So they buy a painting knowing they can sell it or its value will go up." What has not changed since the Renaissance is a widening gap between rich and poor, he said. "Whether the economy is good, bad or stagnating, inequality keeps increasing,"Akkoyunlu said. Inequality only evens out a little when "there is a plague or something terrible." An exception was the 20th century, Akkoyunlu said. "Now we have the ideas of equality, opportunity for everybody. Noble ideas, but I am afraid we might be losing them. Inequality is increasing rapidly again." Akkoyunlu's research echoes French economist Thomas Picketty’s "Capital in the Twenty-First Century," a watershed study of how wealthy the ultrawealthy really are. A native of Hatay in a southern Turkish province on the border with Syria, Akkoyunlu said the concepts of money, business, finance and economics “always attracted me." While his Marshall research project centers on Western economic systems, his research results have, potentially, a global impact. “Capital is very mobile in this century," he said. "So the trends we see regarding inequality are everywhere."